Besides random, other word for the week would be rushed and frustrating. The week began with work, which was fine. 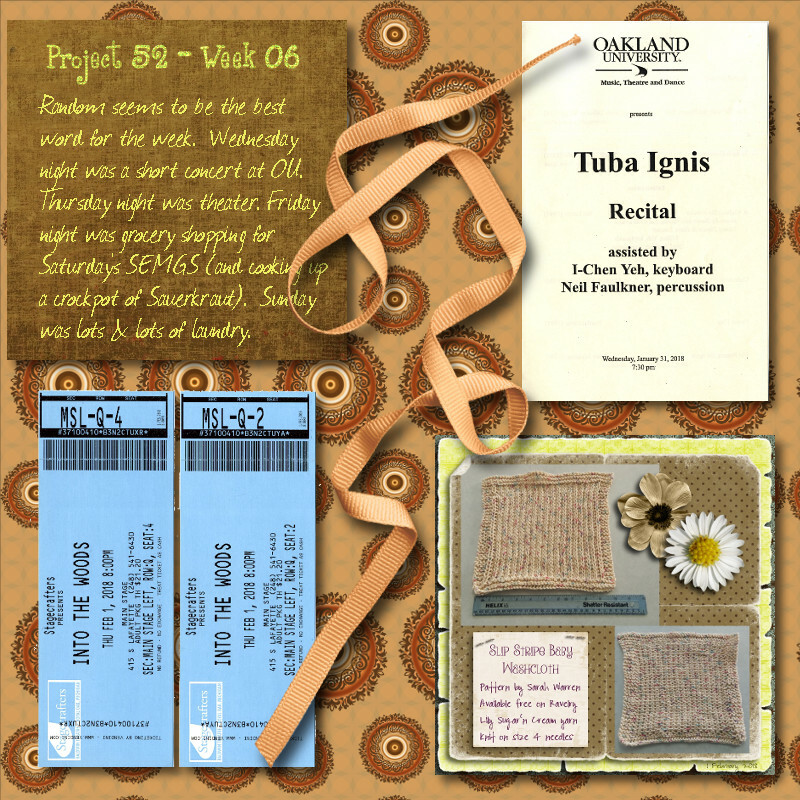 But after work we were going to Oakland University to hear Tuba Ignis debut a new piece they had commissioned. The concert was scheduled to begin at 7:30, so we should have had plenty of time for dinner beforehand and went to Asian Express. My first clue that I may have made a mistake was the number of items blacked out on the menu. I found something that sounded good, tofu in red curry sauce. jebra site="livejournal.com"> tried to order a his entree with brown rice only to learn they no longer serve brown rice. So he ordered it with white rice, only to have the waitress return to tell him they couldn't make that for him either. He picked something else and we waited for our food. My dish, when it came, did not look right, being an orange-yellow red, not a deep red like I was expecting and the vegetables were different that what was listed on the menu. Ttaste-wise, however, it was amazingly good. I planned to bring half home with me to have for lunch the next day only I kept eating it as I waited for jebra to get up and pay the bill. He, on the other hand, was waiting for the person at the counter to finish ordering and she was having the same problems we had (no brown rice, entrees being unavailable). By the time he could pay, every scrap of my dinner was gone. We rushed to the concert venue concerned that we'd be late. When we arrived at the auditorium door, we were alone. We could hear a group playing on stage and I wondered if we had the time wrong. jebra tried to open the door but it was locked. Fortunately someone heard us and came to say that the group was still rehearsing and that the doors would open in the near future. A few more people arrived while waited; although Varner Recital Hall can seat up to 425 people, I don't believe there were more than a dozen or two. The pieces performed were, in my opinion, a mixed bag. There were one or two pieces I loved, one I disliked, and one I absolutely hated. Not even my knitting was enough to distract me from the awfulness. Afterward the performance we talked with Ian (one of the group's founders and someone jebra used to play with in the FCB) and wouldn't you know it, the piece I so objected to was their favorite. After the concert we zoomed home so that I could do my chores and exercise before bed. I have no idea what time it was when I finally got to bed. up my Afrin first. The doctor said she's had patients who experienced adverse effects with Afrin but I'm using less than a quarter of the dose indicated on the box which is why I think I've been lucky. minutes before they locked the doors. I got my stamps and picked up the mail, then it was back to the car and off to the theatre. feeling Friday morning was not a fair exchange for my time and attention. As expected, it was going on 2 am by the time I got to bed and getting to work on Friday was no fun at all. After work we went grocery shopping as jebra asked me to make sauerkraut for SEMGS and we didn't have the ingredients. Shopping took a couple of stores and couple of hours and I was so hungry by the time we got home I was light-headed. I sat down with a big bowl of milk & cereal and ate until I wasn't hungry and I felt better. It was a good hour until I stood up again, and then it was time to clean up the dishes and get started on clearing off enough of the kitchen counter to use the big crockpot. Some of the things on the counter (a smaller crockpot, my blender, etc.) had been up there for long they were grimy. So everything had to be cleaned before being put elsewhere. We don't have a dishwasher, so this was a lengthy manual process. Plus I still had to exercise and take care of the cat's litter box and all the usual before-bed stuff. I was 2:00 when I called it a night and went to bed. I woke up at 5:00 and thought about doing more cleaning but I realized I felt horrible and would not be able to cope with anything going wrong and went back to bed. I felt much better four hours later and went out to start cooking. jebra wanted to help and that meant he did the lion's share of the work. He slivered onions, fried them with butter and kielbasa, and then between us we layered the crock with the cabbage and sauerkraut and chopped apples and a few bay leaves. Four hours later it was ready and we went off to Fred and Laura's house, where we saw friends and true-to-form ate way too much. Someone (Carl, I think) made a golden mushroom soup that was to die for. Everything was good, but that soup... Yum. We didn't get home until late, and of course I still had to take care of the cats, and exercise, and shower. It was quite late (past 3 am) when I fell into bed but I was happy when I woke up and it wasn't much past 10 am. My sleep schedule is already messed up; I try not to make it worse by sleeping in so much on Sunday morning that I can't fall asleep Sunday night. Monday was work followed by band practice and, for me, the usual Monday night stuff. Tuesday was work folled by jazz band practice for jebra and laundry and crochet and cats for me. I could use a nap but there's no time for that. This entry was originally posted at https://mrs-sweetpeach.dreamwidth.org/960122.html.